Cashmere Robes - Wildly extravagant. Incredibly plush. Simply sumptuous. One word says it all - Cashmere. These luxury robes are a gorgeous addition to any woman’s sleepwear collection. If you’re lucky enough to be in the market for one of these specialty women’s robes, there are a few things you’ll want to consider before you start your shopping expedition. We’ve put together a list of the need to know insider tips and tricks that will quickly take you from cashmere novice to expert, so that you’ll be able to choose an amazing quality robe that you’ll enjoy wearing for many years to come. Consider the ply of cashmere. Cashmere is available in varying layers of thickness, that can make a huge difference in how long your robe will last. Single ply cashmere is quite thin and feels heavenly, though it is delicate. It’s also a fair bit less expensive than two or three ply options, which are heavier, and generally more long lasting, and expensive. 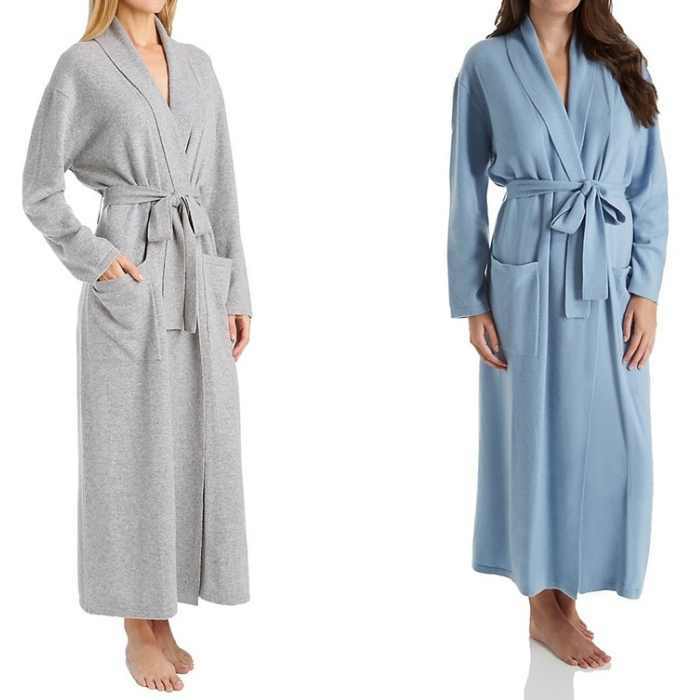 Sleepwear Tip - if you’re looking for a robe that you can wear for several years, and your budget is more flexible, opt for the more expensive two or three ply robes. Look for popular brands that are known for their sumptuous quality knits rather than taking a gamble on a chain retailers version or a brand that you’ve never heard of. Now is the time to be a bit of a label snob and seek out designers and brands that are sought after for their gorgeous cashmere sleepwear, so you’ll be sure to buy a robe that’s great quality. Cashmere wool occurs in a small handful of natural rich earth tones, including shades of grey, brown, cream and white. However, a gamut of gorgeous colors for these beautiful robes can be created by dying the wool. Give the robe a quick stretch test. Try this test when you’re in the store facing a selection of robes and not sure. Gently stretch a small section of the fabric and see what happens. Higher quality cashmere will stretch back and keep its shape, whereas cheaper versions will sag over the long run and lose their shape. Tip - pay close attention to the stretch test. You’ll want a robe that will hold its shape and not become slack or baggy, and become unwearable after a short time. Another quick test you can do in the store is holding the fabric up to the light. If it’s really thin or you can see through it, it’s a lesser quality than fabrics that don’t show as much light. The more transparent pieces will often feel softer, which can trick you into thinking they’re finer quality, but the thicker fabrics are a better buy simply because they are more durable, and will soften up as you wear them. And, best of all they’ll last longer. Cashmere luxury robes should not be exposed to deodorants, perfumes, makeup, hairspray, or other such chemicals. These can irreparably damage the wool and can cause visible staining. Look carefully at the surface of the cashmere when you’re shopping for your robe and you can tell which intimate apparel fabrics will pill and which ones won’t. If the surface looks fluffy with looser fibers standing up on the surface it’s more likely to pill. Flatter knits are more tightly constructed and will keep their smooth finish long after you buy it. Nothing is more disappointing than buying a cashmere robe only to have it pill and snag, so pay special attention to the fabrics surface to make sure you’re buying the best quality. Tip - most of us have sweaters buried in our drawer that we’ve stopped wearing because they pill and end up looking awful. Minimize the risk and take a close look before you buy. Always check the label of a lingerie garment before you buy, even if it’s labeled as cashmere. You’ll often be surprised to see that it’s a blend of other wool, with only a small percentage of cashmere. While there’s nothing wrong with blended cashmere, it’s always best to know what you’re spending your money on, so if you’re after a pure cashmere robe you’ll want to check the tags to make sure that your robe is 100% cashmere and doesn’t include any other fibers in it’s composition.